Next, the authors go into sections on each of the theme parks: Magic Kingdom, Epcot, Disney's Hollywood Studios and Disney's Animal Kingdom. This is the section I found most valuable, especially for the two parks we were planning on visiting ~ Magic Kingdom and Hollywood Studios. The authors give a general description of the theme park and some of the key attractions, and include a detailed map showing where everything is. They have a section on Planning Your Day for each park, which is very useful, including information about deciding when to go and what to do. The thing I thought was most useful was the hour-by-hour wait times charts they had for each park. This was great! So, for example, it showed for the Buzz Lightyear ride in Magic Kingdom that at 10am, the wait time is generally 25 minutes; by 1pm, it's 45 minutes; and at 6pm, it's down to 25 minutes. This chart helped us plan our day and make decisions on which rides to go on when. The other chart they include for each park is the Fastpass return times chart. This is incredibly valuable information as well. The Fastpass system lets you get a special ticket for the ride, which lets you return later and ride without waiting in line. The ticket has a specific time when you can return to ride. This chart tells you when that time generally is. So, for example, if you pick up a Fastpass ticket for Space Mountain at 10am, you will most likely be able to return and ride at 11:30; if you get the ticket at 1pm, you'll be able to return and ride at 5:25pm. And if you try to get a Fastpass ticket for Space Mountain at 5pm, they'll probably be out for the day. If you're looking for more assistance with setting up a schedule for your day, they offer a plan for each park, including times to do each activity. The only issue is that there is only one suggested schedule for each park, and this schedule isn't going to meet everyone's needs and desires. I've seen other resources that provide a variety of plans for a variety of situations (with little kids, with teens, adults alone, etc.) That would be more useful. After offering that one plan, they go into detailed pages on each attraction, including average wait times, and the parades and fireworks featured at the park. After covering the theme parks, the book goes into detailed sections on each water park and Downtown Disney, sports and recreation activities in the area, the Disney resorts and hotels off-property, and special events at different times of the year. 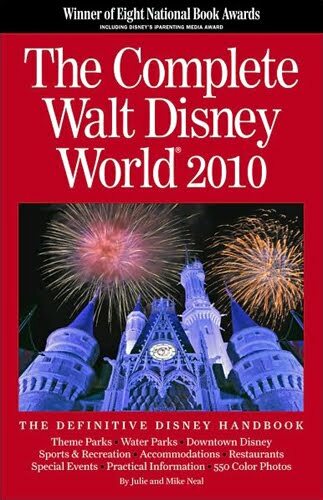 Overall, this would have been a fine resource if you were heading to Disney World in 2010. Now, however, things have changed quite a bit. For example, we visited the Magic Kingdom last month, and all of Mickey's Toontown Fair was closed for renovations. The book didn't cover this fact, so some of the information about where things are were wrong since things have been moved around. However, this was still a good resource to have, and if they publish an updated version for another year, I will likely check it out next time we go to Disney! This review was written based on an e-book copy of The Complete Walt Disney World 2010 that I received from Coconut Press through NetGalley in exchange for an honest review. LOVE THIS!!!! I am such a Disney fan and this type of book is exactly what I need!